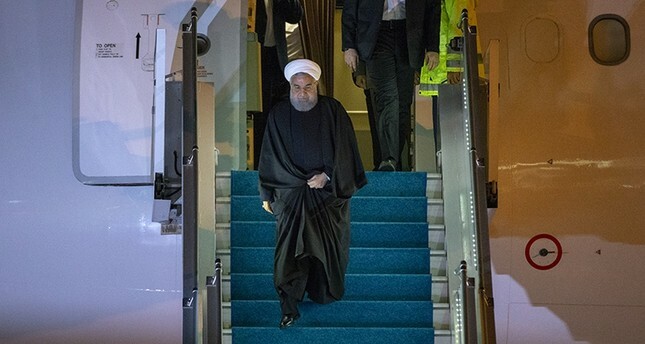 Iran's President Hassan Rouhani arrived in Istanbul on Wednesday evening to meet with his counterpart Recep Tayyip Erdoğan. Rouhani on Wednesday hailed his country's close ties with Turkey and called for stepped-up economic relations. Speaking to reporters at Tehran's Mehrabad Airport before departing for Ankara, Rouhani said that economic relations would top the agenda of talks at a Thursday meeting in Ankara between the two leaders. On Thursday, Rouhani is slated to attend the fifth session of the Turkey-Iran Cooperation Council in the Turkish capital. "We will discuss means of enhancing ties and overcoming the obstacles to achieving that goal," Rouhani said, adding: "Turkey is extremely important to Iran." "We share deep historical, cultural and religious ties," the Iranian president said. "In recent months, Turkey -- and especially President Erdoğan -- has taken a firm stance against the U.S. sanctions (on Iran)." In reference to recent tripartite talks on Syria between Turkey, Iran and Russia, he said: "We're pursuing two very important issues: the security of Syria and the return of refugees." He added: "But Syria's future must be decided by Syrians." Erdoğan and Rouhani will chair the Fifth High Council for Strategic Affairs, at which the two countries are expected to increase bilateral trade volume to $30 billion. The two leaders are expected to sign important agreements in the fields of economy, politics and culture during the visit. Erdoğan and Rouhani are also expected to discuss the latest developments in Syria, where the two countries support opposing sides in the seven-year-long civil war. Turkey backs the opposition to the regime of Bashar Assad, whereas Iran is one of the closest allies of the Syrian regime, in addition to Russia. All three countries are taking part in the peace talks known as the Astana talks and held numerous bilateral and trilateral meetings to end the fighting and launch a political process. Rouhani met with Parliament Speaker Binali Yıldırım earlier this month, and expressed Iran's desire to further improve relations with Turkey and speed up implementation of an agreement to boost cooperation in numerous fields, including banking and energy topics, particularly trade under sanctions imposed by the U.S.
Iran has been seeking Turkey's support, in addition to other trading partners like the European Union, China and Russia, in taking measures against the sanctions reinstated by the Donald Trump administration on May 8 when he announced the withdrawal of his country from the 2015 Joint Comprehensive Plan of Action (JCPOA), more commonly known as the Iran nuclear deal.